The supermarket chains and discounters have launched an offensive against plastic waste. The reasons: Consumers want either none or more sustainable packaging, especially for fruit and vegetables, and the new Packaging Act will come into force on 1 January 2019. It will be combined with a stronger emphasis on recycling. 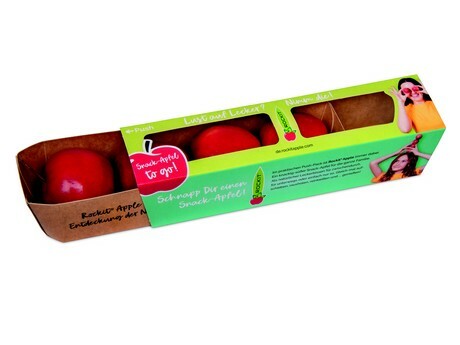 "Due to these problems, in recent months we have developed something completely new," says Jens Anderson, head of marketing for Elbe-Obst from Hollern-Twielenfleth, of Red Apple Germany. At present, it seems that the new packaging idea for the Rockit will be "used worldwide and certainly in Europe". This type of packaging is one of the first on the market. Unpacked, the Rockit can not be marketed. As a background: The miniature apple variety is to be marketed as a vitamin-rich snack for on the go at supermarket checkouts, at petrol stations, at motorway service areas, at railway stations or airports. Therefore, the packaging for the Apple-to-Go must be resealable. The producers want to start this season. The first trees on the Lower Elbe were planted by 15 farmers in 2015/2016. By the end of 2018, 170,000 trees will be available on 50 fruit farms nationwide. Now, the nationwide harvest volume of 700 tons is so large that the market launch can go ahead, among others within food retail and during the week of the German apple in January, at ten stations. At the Niederelbe the mini apple will not yet be in the shops. It all starts in the north with the Edeka-Minden regional company. 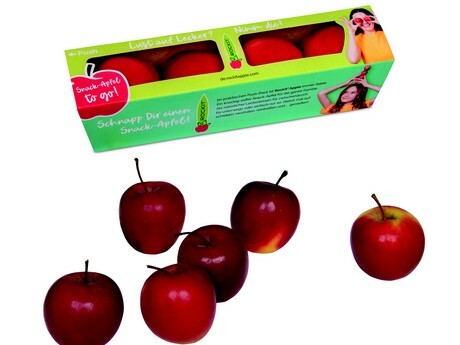 The pack with four apples will cost 1.99 euros; the fruits are 40 to 60 millimeters in diameter. The new apple will be sweet, crisp, juicy and well storable, according to the director of the Orchard Center Esteburg, Dr. Karsten Klopp. The apple core can be consumed as well. With this "bonsai" apple, the producers want to conquer new markets. It is well known that the apple consumption in Germany is declining. Producers need to be responsive to demographic change (fewer consumers), rising production costs and growing global apple crop yields. The slogan is: added value through a more diverse, higher-priced variety spectrum. In the home of the Rockit, in New Zealand, the miniature apple has already been marketed successfully. It was invented by Phil Alison of the Havelock Fruit Company. It is an exclusive club variety, cultivated in 20 states. In Germany, the snack apple is cultivated in the Altes Land, in Saxony and on Lake Constance, under the leadership of Red Apple Germany GmbH. This is a subsidiary of the German fruit variety consortium - DOSK for short. There are nine producer organizations involved in this project. The fruit farmers of Elbe-Fruit and the M.A.L are also on board, as well as the Württembergische Fruit and Vegetable Cooperative and Veos from Saxony. "It's a niche product," says Anderson. Younger and more mobile people are the target group. Klopp: "The Rockit would also be a good school apple."